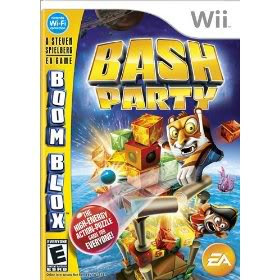 "Get ready for even more blox-busting action with BOOM BLOX™ Bash Party for Wii™, the sequel to the critically-acclaimed BOOM BLOX™ game for Wii. Developed by EA in collaboration with director and producer Steven Spielberg, BOOM BLOX Bash Party takes destruction to new heights, providing the ultimate social gaming experience! BOOM BLOX Bash Party will get your party started with new Versus, Co-Op and Team Play challenges - twice as many multiplayer challenges as the original BOOM BLOX." * New Blox! New Shapes! New Tools! This is a great option if you are looking for a game the whole family can play. I found nothing objectionable in it at all. It offers several ways to play including competitive and cooperative game play, which is something the whole family really enjoys. This game seems to bring out the competitive spirit in us all, as it seems we are always trying to best each other. If you are looking for a game the whole family will really enjoy, Boom Blox Bash Party is a great choice.